Teaching is more than a profession. It is a way of being in the world, and extends beyond the walls of a traditional classroom. A Stanford-trained Ph.D. in Slavic Languages and Literatures, I have been teaching courses in Russian language, literature, and culture for twenty years. Yet as a teacher, I view my field not as an end itself, but as a powerful vehicle for providing students with something they can take with them into whatever professional path they choose: a lifelong passion for continually broadening their intellectual and personal horizons, a deepened capacity for critical and creative thinking, a commitment to social justice, and an embodied understanding of the world and their purpose in it. As a graduate of Amherst College, I have always had a deep appreciation of the value of a broad liberal arts education and of the life-changing potential of great teaching. I know from personal experience how these things can alter the trajectory of a young person’s course of study, career, and even life. I strive to bring that awareness to everything I do as a teacher. Because of the variety of my students over the years, including university and graduate students, nontraditional adult learners, professionals, executives, and even incarcerated youth and adults, I have had the challenge of developing innovative methods of teaching that make the study of foreign languages, cultures, and the humanities relevant to an unusually wide range of audiences. As a result, I have acquired teaching experience that goes beyond the traditional college classroom, yet which is applicable to the rigorous standards set in an interdisciplinary academic environment. I am a professionally trained actor, an entrepreneur, and worked previously as an international management consultant, which allows me to communicate effectively with students from diverse backgrounds and disciplines. No matter the subject, I seek to make every classroom a venue in which humanists and scientists, artists and businesspeople, work together and learn from one another while examining what it means to lead purposeful, creative lives. At the heart of my teaching philosophy is a commitment to educating the whole person. To that end, I encourage students to connect course content with issues confronting their world and their own lives. My students compare and contrast Russian and American concepts of justice, power, leadership and success. They write actual letters to actual authors and professors, engaging them in discussion of the vital topics of the day. They reflect on big questions, such as: What is the good life? What does it mean to be successful? What is my responsibility to others? Given that I will die, how should I live? Another way I help students make connections between their work in my classes and their other intellectual and creative pursuits is by doing individual and team-based creative projects. One group of students wrote, directed, and produced an original documentary film illustrating the contemporary relevance of classical Russian literature. Another student, an artist, created a portfolio of scenes from classical works of Russian literature, and in her presentation she explained how her interpretation of the original texts inspired her artistic creations. In a graduate seminar on Russian theater students created original actor’s and director’s scores for Chekhov’s plays. Through such creative projects students discover passions and interests they never knew they had—others feel encouraged to use their known talents in a way that previously felt uncomfortable exploring in traditional classroom settings. “I’ve never felt more alive in a class,” wrote one student in an anonymous end-of-semester evaluation of my course “Tycoons, Tyrants, and Tortured Souls in Russian Literature.” “Your course is rocking my world view,” said another. When students are personally engaged, they work harder and learn more, which leads to an overall positive learning environment for everybody. Furthermore, in today’s rapidly shifting job climate, information can be fleeting, but intellectual versatility, imagination, and creative passion never lose their market value. My own creative passion over the years has led me to experiment with ways to connect the classroom directly with the community through various forms of experiential and service learning. In 2009 I created a service learning course at UVa called Books Behind Bars: Life, Literature, and Leadership (“BBB”). During BBB, now in its sixth year, undergraduate students travel weekly to a juvenile correctional center and lead incarcerated youth (“residents”) in discussions and creative activities related to classics of Russian literature. According to research findings, virtually all BBB residents have reported an increased interest in attending college; some are now enrolled in college, including one who had no such plans at the start of the course. The findings also suggest improvement in residents’ social skills, impulse control and decision-making. UVa students report that BBB has helped them develop valuable professional leadership skills, including diplomacy, teamwork, effective planning, and creative problem-solving. They say the course has helped them to clarify, and in some cases rethink, their career objectives and that they learned more in BBB than they have in other courses. Both groups report advancements in moral development and personal growth that are unusual for a college course. They say BBB has increased their interest in civic engagement—in their desire to make a positive difference in their communities and in the world. Just as I believe that what happens in the classroom can and must be connected with the concerns of the larger community, so, too, I believe that my classroom teaching and my private scholarship fundamentally enrich one another. Many of the ideas contained in both of my books of literary criticism evolved out of my quest to relay Tolstoy’s artistic genius in a way that undergraduate students would find clear, compelling and personally relevant. My Tolstoy scholarship, in turn, has informed my teaching in unexpected ways. Tolstoy often considered himself to be a teacher first, an artist second. How he used fiction as a pedagogical tool has taught me much about the art of transformative teaching. This confluence of literary research and pedagogical interests has led to my immersion in the scholarship of teaching. The work of L. Dee Fink, Ken Bain, Parker Palmer, Anthony Kronman, and Paulo Freire have had a particular impact on my thinking. Beyond these, I also am interested in the research on human motivation, community-based learning, and metacognitive questions (especially, what it means to “know” one’s discipline), and the implications this research has for teachers wanting to facilitate deep learning in their students. Finally, my combined interest in literary scholarship and pedagogy has informed my work as a public scholar. I seek out opportunities to engage general audiences as a writer, speaker, consultant, workshop leader, and even entertainer. In May 2014 I was invited to appear with two of my students and a former inmate on Katie Couric’s nationally syndicated television talk show to discuss the Books Behind Bars course. 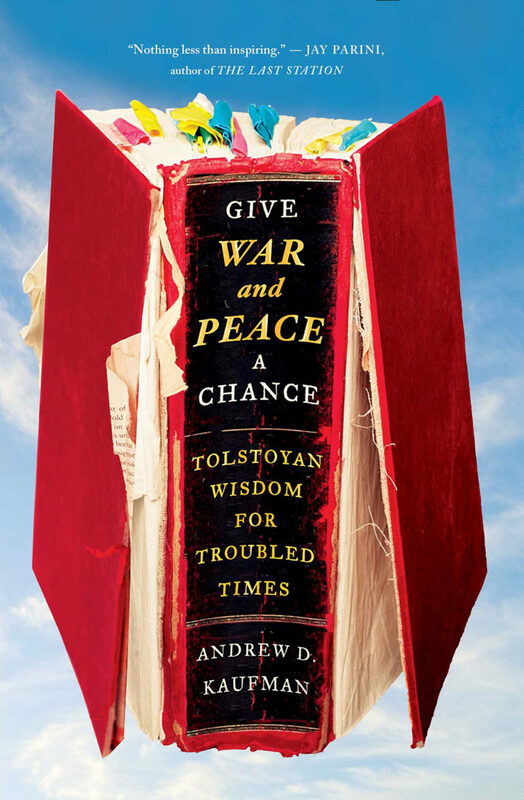 And my most recent book, Give War and Peace a Chance: Tolstoyan Wisdom for Troubled Times, published by Simon & Schuster, seeks to make one of the world’s most intimidating novels both accessible and enjoyable to the general reader. With years of pedagogical thinking and experimentation under my belt, I am now in a position to share the lessons learned with other teachers. For that reason faculty development has become of increasing interest and importance to me. For four years I have spoken to a group of international faculty at Ken Bain’s annual Best Teachers Summer Institute, where I facilitate interactive workshops designed to help faculty from many different disciplines enhance student engagement in their classrooms. UVa’s Teaching Resource Center has invited me to put on pedagogy workshops for UVa faculty, including one at their annual Course Design Institute. They also have invited me to co-present with them at the annual conference of the Professional and Organizational Development Network in Higher Education. I have shared my teaching experiments and discussed teaching innovation more generally at the Aspen Institute, the Hauenstein Center for Presidential and Leadership Studies, in the Washington Post, and at colleges and universities across the country. I also seek out opportunities to consult with individual faculty at UVa and beyond on various aspects of their teaching, including course design and assessment, student engagement, community-based learning, and enhancing student creativity in the classroom. In sum, helping people—students, teachers, and general audiences alike—achieve their fullest professional and personal potential is not only one of my greatest joys. It is also my mission as a teacher and a human being.